Life On The Reef is a serene tropical underwater scene. This wall hanging measures 48" x 52". Easy patchwork background gives movement to the quilt. 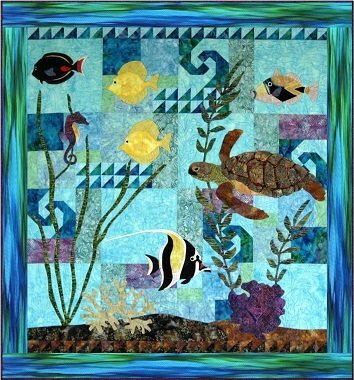 Sea turtle, Achilles Tang, Yellow Tang, Humuhumunukunukuapua'a, and Moorish Idol are found swimming along with a Sea Horse and the bottom has sea grass, kelp, elk horn coral and fan coral. Confident beginner with experience can make this piece. The applique can be done with fusible or hand applique.